After you finish reconciling a credit card account in Quicken 2012, Quicken does two things. First, if some of the stuff in the credit card register doesn’t agree with the credit card statement, Quicken displays a message box to alert you to these, er, discrepancies. It then suggests you let Quicken bring your records into agreement with the statement. To synchronize your records with the credit card statement, verify that Quicken is using a reasonable expense category to “categorize” the discrepancy and then click Adjust. Quicken also does a second thing after you finish reconciling a credit card account. Quicken asks whether you want to pay the bill. 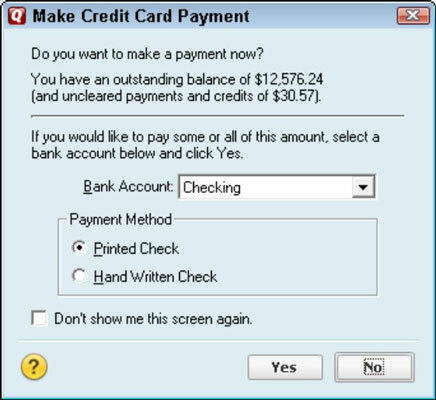 The Make Credit Card Payment dialog box is the tool that Quicken uses to collect the necessary data. You simply identify the bank account on which you want to write the check and indicate whether you’ll use a printed check or a handwritten check. Quicken then records a check that pays the credit card balance into the register. You can edit, print, and do whatever else you want to do with this check in the usual way.